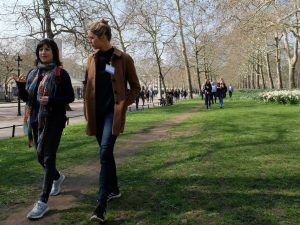 Have you tried coaching while walking? 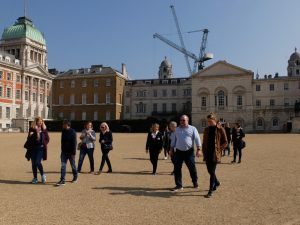 ‘Invigorating’, ‘Inspiring’, ‘Great for shifting perspective and getting unstuck!’ These are some of the reflections on coaching walking made by a crowd of AoEC coaching graduates who joined me last week to walk and talk while connecting with each other and London. Remarkably, after a spate of cold, rainy, stormy weather, the sun shone. 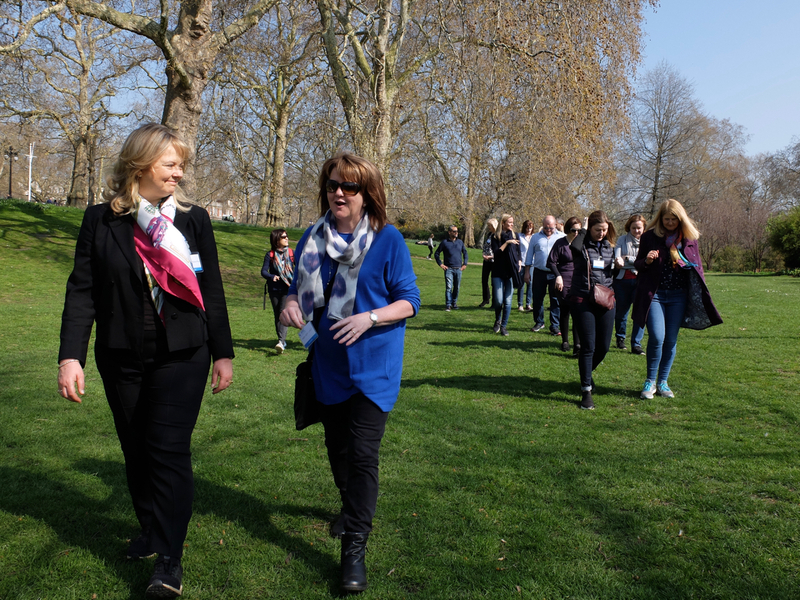 We wandered through warm St James Park enjoying conversations and spring bursting with colour and life all around us. 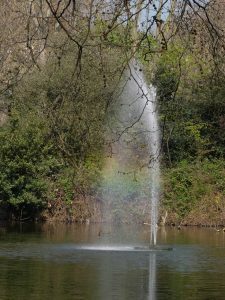 Even the Tiffany fountain gave us a rainbow. The group had a chance to walk and talk with new people, reflect on their own coaching experience, try a new technique and boost their own wellbeing. Coaches often work on their own. Coaching often takes place indoors or in work spaces. The morning gave an opportunity to get out, connect with each other, have a series of moving conversations and enjoy this beautiful environment. This type of group coaching walking is easily accessible and supports resilience and health on a number of levels. § Walking and being in nature gives a sense of movement not only physically for the client but also for thoughts and ideas. It is freeing and enables the client to open up. This walk took place in warm sunshine. However, I work and walk outdoors with individuals and walks all year round. The most frequent question I was asked by the participants was about the weather. How do you coach while walking in the rain or in winter? I like the rain because it clears the parks unlike sunny days that can bring out the crowds. Perhaps you could also enjoy wandering in the rain – puddle jumping and shiny reflections. It only rains on 29% of days per year in London meaning there is a good chance that it won’t rain during your walk. Even if it does rain it may only be a short, passing shower. The weather can all add to the experience and the health benefits of being walking and being outside are needed all the more during the darker days of winter. Wearing the right clothes and taking a rain coat or brolly is essential. For the days of storms, strong winds or sideways rain, there are lots of ways to adapt. There is often a place to take shelter in a park or street. I’ve also coached in indoor spaces such as the British Museum or the Turbine Hall of the Tate Modern. How does coaching walking work for you? 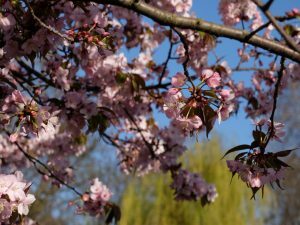 There is probably a park or a quiet space somewhere near your next coaching session, will you take your next client outside? Anise is here to help you feel good in the work you do. Gain some headspace in your work with a coaching walk.